Darling Diva Candles Review + Discount! New Year’s Resolutions: made to be broken? Happy 3rd of December and welcome to another Blogmas post! Today’s post is my 2018 Christmas Bucket List and this one is a collaboration with one of my all time favourite bloggers – Soph from love, Soph! If you’ve been around for a while then you’ll know that Soph and I collabed back in September on our Sixth Form Goals post, so if you haven’t read that yet, you can find that here. I did actually do a bucket list post for last year’s (rather unsuccessful) Blogmas and I’m really excited to update it, so let’s jump straight in! I’ve been trawling Pinterest for months, creating a board of all of the best Christmassy DIY ideas and can’t wait to try them all out – there’s nothing that gets me into the festive spirit more than a bit of creativity! I also think that DIYs can make great gifts so I’m planning a cheeky lil’ DIY gift guide for later on in Blogmas – keep your eyes peeled for that! Although I only live an hour away, I’ve never visited the Birmingham Christmas markets before, so I’m really excited to be going for the first time this year! Apparently it’s amazing and I can’t wait to get some great shots for Instagram and some cute gifts for my friends and family. Although I don’t particularly like eating Christmas cake, I really appreciate how pretty and instagrammable they are so I’d love to try my hand at decorating one this year, even if it’s just for the sake of the gram – I’m sure my nan will be grateful, she loved Christmas cake! Okay maybe not all – I really don’t like coffee! But they have some amazing looking cakes and hot chocolates that I really want to try – err how nice does Caramelised Orange & Cream Hot Chocolate sound can we please?! A rite of passage, am I right? I don’t get to bake often, but I find it so relaxing and rewarding when I do. Gingerbread is one of my favourite Christmas flavours and I really want to try my hand at some decorative piping to make them look pretty too! I’d also really like to try making mince pies because they’re my favourite festive snack and it’s been so long since I had a proper homemade mince pie. My nanna used to make them every year but I’ve never tried them myself, so I’d love to start this year! Okay, I have kind of already ticked this one of the list this year but I love ice-skating so much and really ought to go more often. It’s also the best excuse to wrap up warm and wear a bobble hat so I definitely want to go again! I have a whole list of Netflix Christmas movies that I want to watch this year and what could be a better way to get into the spirit of the season than watching them all at once?! Hot Chocolate and Quality Street required, obviously. This is something I’ve wanted to try for years – at all of the Christmas markets I’ve been to, I’ve seen these incredible orange garlands with cinnamon sticks and pine cones and they smell insane and look so so festive but they’re really expensive and I’m pretty sure I could make one myself for far less money. I’ll keep you updated on Instagram about how it turns out! I mentioned earlier on in the blog that my Blogmas last year wasn’t that successful so my main goal for this month is to complete all 12 days! I’m much better prepared this year, and I’ve written quite a lot of the posts already, so it’s looking hopeful at the moment – fingers crossed! Is there anything on your bucket list that I didn’t include? Let me know in the comments below! If you enjoyed the post don’t forget to like it, and follow my blog so you don’t miss the rest of my Blogmas posts! I can’t wait to read Soph’s bucket list and you can read it too here – she’s also doing a 12 days of Blogmas and all of her content is amazing so make sure you subscribe to her blog and follow her on instagram @lovesophblog_! See you next time for another festive post! Blogmas Day 3: Gifts from Small Business! 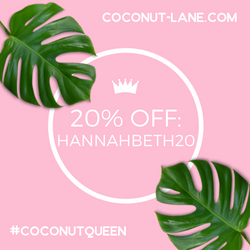 Use this code to get 20% off at Coconut Lane! Enter your email address to make sure you never miss a post!